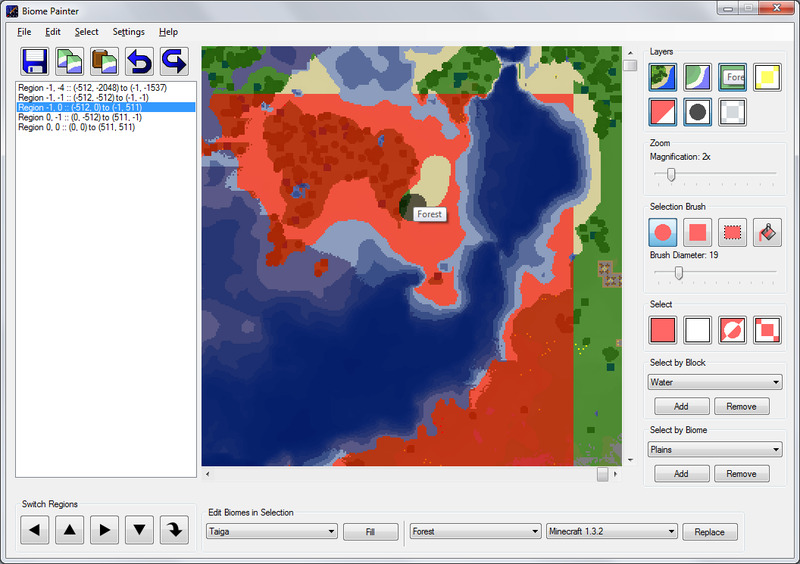 Biome Painter is a stand-alone program for editing biome information in Minecraft save files using the Anvil file format introduced in Minecraft 1.2. After loading a region, left click to paint your selection over the map of the region and right click to erase. Once an area has been selected it can be filled with a particular biome or have all instances of a particular biome within the selection replaced with another biome. In addition to arbitrary biomes, the biome generation from various versions of Minecraft can be used to populate the selected area with the biomes that would have been at those particular coordinates while playing that version. The left mouse button can be used to paint a selection over the map of the current region, and the right mouse button to erase that selection. This program only alters biomes, which affect the shade of grass, water, and the sky, what mobs can spawn in an area, and whether rain or snow is possible. For example, after changing an area from taiga or ice plains to another biome such as forest, existing ice and snow cover will remain until removed using another tool such as MCEdit or removed manually in Minecraft. If, however, you use the "Set Chunks in Selection to be Populated" option under the Edit menu, the next time the specified chunks are loaded in Minecraft it will fill them with trees, snow cover, water, lava, and ores depending on the biome(s) the chunk is in. If that chunk has already been populated or already has player-made structures in it, you may find it clogged with more foliage than you wanted. Also smooth stone in your structures may be replaced with ores, dirt, or gravel. I strongly suggest that if you decide to use this feature you make sure you have a current backup copy of your world before proceeding. The outermost two chunks (32 blocks) along the edge of the image are from the regions adjacent to the currently loaded one and read-only. Thier purpose is to help with lining up changes to biomes along the border between two regions. To edit those blocks you need to switch to the region that contains them. Custom block color and biome definitions should be added to Blocks.user.txt and Biomes.user.txt respectively. The other two files, Blocks.default.txt and Biomes.default.txt can be kept up to date from "Check for updates" under the Help menu. Entries in the user files always override entries in the default. If a world was created before Minecraft 1.2 and needed to be converted, Minecraft will have populated each chunk's biome information based on the biome generation from version 1.1. Minecraft will still use the latest biome generation code for newly generated chunks in any world whether it was originally converted or not. When filling a selection with biomes based on Minecraft Beta 1.7 or earlier please remember that not all biomes in that version exist in the current version of Minecraft. As such, areas that would have been shrubland or seasonal forest are all set to forest, for example. Areas that would have been swampland in Beta 1.7 are set to forest in order to look a close as possible to how they would have in the past. Additionally the Beta 1.7 biome rainforest is set to yield the Minecraft 1.2 biome jungle. Biome Painter requires the .NET Framework 4.0 (Client Profile) or better to run on Windows. It is possible to run it on Mac with the Mono platform. All binary downloads can be found at http://mblaine.github.io/BiomePainter/downloads. Please view LICENSE.txt at https://github.com/m...ter/LICENSE.txt. Please view CHANGELOG.txt at https://github.com/m...r/CHANGELOG.txt. The source for Biome Painter is available at https://github.com/m...ne/BiomePainter. Awesome! BiomeEdit can do the same thing, but with yours, we can actually select what biomes we want changed based off of the map's Region format. Thank you for this program. It helped to finally bring a serious to me case, to close (I thought the Anvil format messed up my map's biomes. This shows they didn't). I will never use SPC's /biome command for the rest of my life. It gave me nothing but grief of this. Between BiomeEdit for massive unattended area conversions and this for detail work, I couldn't be much happier! It's letting me seriously tweak the adventure map I'm working on. It's even allowing for special effects of sorts. I can't go into much more detail on that yet, as it's a hush hush idea I've had. I do have some feedback however. I've noticed that where the mouse is pointing, and where Biome Painter thinks the mouse is pointing can be 2 different places. Also, the distance between these 2 points, can change, depending on where in the screen you are pointing. I'd also suggest a couple of features. 1: Instead of the panning sliders, maybe something like Photoshop. Hold space and then click and hold the mouse to drag. 2: The ability to highlight a region of biome data and copy it exactly to another region of the map. It would be good for anyone using portal tricks to make you appear in a different version of the same area, yet with identical biomes. This is something I'm currently working on, and the sheer scale of the build means there is no other area anywhere near by with even vaguely similar biomes. Other than this, I just have one word to say. FANTASTIC!!! A Notch for you! I'm glad you like it. And I really appreciate the feedback. I can't promise anything, but I'll look into both of your suggestions. I'll update the original post if/when I release an updated version, but that'll still be a couple of days from now at least. Is there any way to use it with mac? Unfortunately I don't have a Mac to try anything on. You can try visiting http://mono-project.com and downloading and installing the Mono runtime for OS X. I would also look at http://www.mono-project.com/Guide:Running_Mono_Applications. Hopefully that will work, but I have no way to try myself. Sorry I can't be more help. I have also noticed that some biome overlays seem to have the same colour as each other. I've got jungle and forest touching and you can't tell the difference by colour. I've not played with lots of the other biomes yet, so I not sure others match. Hmmm jungle and forest should be different colors, here's what I get http://imgur.com/cRJVP. I can try and make them less similar. A great little program! It's helping me sort out the mess of our hybrid 1.7.3 / 1.8.1 / 1.2 world which I discovered yesterday also had a spontaneous seed-change somewhere along the way. Sigh. Damn power cuts! None of these are hugely important but they'd be nice. You can do 2 by marking in a chunk and choosing Select Chunks and 3 by some clever use of Invert or as a last resort selecting another region and chucking your changes. A very usable program for a first release. ****, I really need to start running some .NET Framework for mac. New release, please see op for download link. This update includes support for undoing/redoing changes to the selection and biomes, zooming in and out with the mouse wheel, and copying and pasting biomes. For the full changelog, please take a look at https://github.com/m...r/CHANGELOG.txt. And thanks again for all the feedback so far! That's cool. I don't have much experience with World Painter. I'm not criticizing it at all, but it seems more suited to creating new worlds than editing existing ones with existing structures. I designed Biome Painter to be useful in making small tweaks to biomes in a world as it is rather than making sweeping changes to the landscape. WorldPainter is a great looking program with heaps of potential. I'm sure I could spend hours and hours fiddling with landscape. It's just the thing for creating your custom world just the way you want it...from scratch. BUT it's a totally different program. It doesn't even operate on Minecraft maps - it uses its own format. 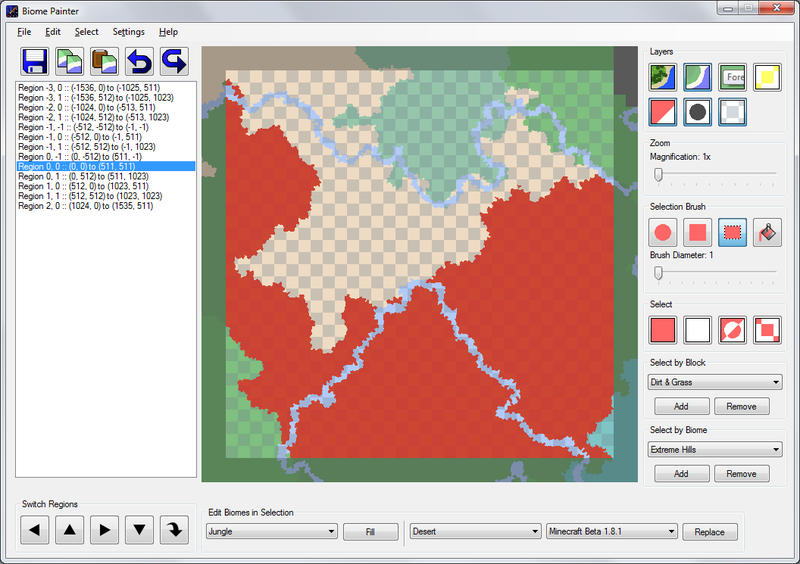 It can import landscape from a map and it can export to Anvil map format, but it's not a map editor. All that importing and exporting is not very practical for just adjusting some biomes and it can't generate biomes from different versions of Minecraft. Also WorldPainter is a year old. Hardly a fair comparison. Biome Painter is just starting out and will no doubt get more sophisticated as it goes along. TLDR: I love WorldPainter but it wouldn't even occur to me to use it to edit some biomes. New version, download link in original post. The most important change this time is that under the Edit menu, you can flag the currently selected chunks to be repopulated by Minecraft. I strongly suggest backing up a world before trying this. Chunks set to be populated by Minecraft will be will filled with trees, snow cover, water, lava, and ores depending on the biome(s) the chunk is in. If that chunk has already been populated or already has player-made structures in it, you may find it clogged with more foliage than you wanted. Also smooth stone in your structures may be replaced with ores, dirt, or gravel. Again, backup before trying! Other changes include a dramatic reduction in the time it takes to save a chunk, and brush size being adjustable by holding ctrl and moving the mouse wheel. As before, the map can be zoomed in and out with the mouse wheel, without holding the ctrl key. For the complete list of changes, please see https://github.com/mblaine/BiomePainter/blob/master/CHANGELOG.txt. Feedback of any kind is appreciated. And thank you for reading this post and/or using my program. New version, download link in original post. It's looking good - the brush visibility was something I was going to suggest. Next suggestion - arrow buttons at the edges of the display to move between regions. A way more complicated suggestion: it'd be great to be able to select a particular type of terrain and apply a biome to it. I realise this is a little more difficult for a program to recognize than for me, but it would be useful. Perhaps you could have a command to expand a selection to all similar adjacent terrain. A simple place to start might be selecting all the water in the region. The desert is a desert again, and the forest is a forest again. For some reason the tool doesn't work for me. I used it to paint over some swamps and taiga and replace them with plains. Then I went into MCEdit, and deleted the chunks in order to regenerate them with the new biome's terrain. However, it just regenerated the previous terrain. Am I doing it wrong? I made sure to save all the regions as I painted over them. You deleted the chunks. How can you have any biome information stored if you delete the chunks? You need to make a selection in MCEdit (not a chunk selection) and delete the blocks and entities, not chunks. I haven't experimented with the new repopulate option, but you could also try that instead of using MCEdit. Under the Edit menu in Biome Painter use "Set Chunks in Selection to be Populated". This might do what you want. Hmmmm. Except I don't think Minecraft will regenerate empty chunks, only if there's no chunk there at all. And no chunk means no biome information either. I'm not sure there's a way to generate whole new terrain of a specific biome without modding Minecraft itself or using some tool I haven't seen yet. Setting chunks to be populated by Minecraft will fill them with plant life and/or snow and ice based on biomes the next time Minecraft is run without actually changing the dirt/grass/sand/stone. Not sure if that suits your needs, Rayziik. But as SeansanAstrail said, I'd strongly recommend making a backup of your world before trying it. OK...something that might actually work. In MCEdit select the area you want to change and replace wood, leaves and snow with air. In Biome Painter change the biomes to plains and set the chunks to repopulate.